Hat tip to city hunter. tagged: canter, dekotora, flatbed, mitsubishi. Doesn’t the US allow these to imported due to the fact that it’s a Commercial Vehicle and can bypass the safety regs? where are the night pictures? i want to see this thing lit up like the christmas tree that i know it is!! 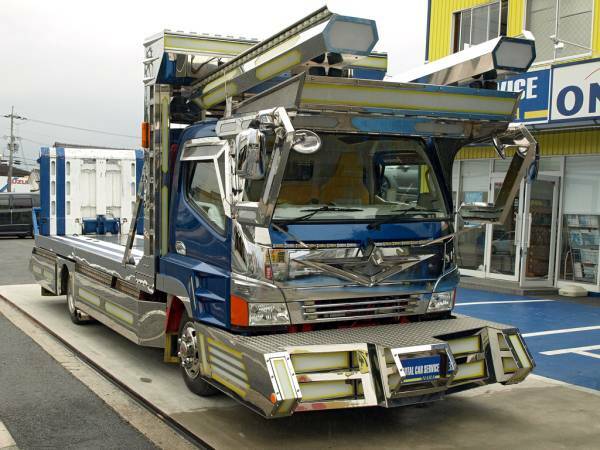 Is Optimus Prime in Japan? Sweeettt!!! Coolest thing EVER. what does it take to turn a LH tow truck into that?!! It looks like something from Star Wars. I’d hate to follow that thing on a sunny day! I like how the tail gate inexplicably says, “God Hand”. Also, wouldn’t that ramp be a challenge when loading up your bosozoku Soarer? All those mirrors in the back look like a good way to earn business! Man! I totally need that to haul my Veritech fighter around. @ Tyler – That’s why the ramp does that cute little lay flat then angle up trick! Jesus, the dash has more switches than the space shuttle. Used to be the Sterling 360, but the brand dissapeared.